Preventative Maintenance is the key to making your pavement investment last. Only one thing will maximize your pavement’s life – routine preventative maintenance. Our experience shows that a preventative maintenance plan is key to protecting your investment. Minor asphalt defects must be identified and repaired early – before major asphalt repairs are needed. Sealing your asphalt pavement is also crucial to blocking deteriorating elements and chemicals. Minor defects can rapidly become pavement failures that require major asphalt repair expenditures. One way to prevent larger problems is to have your pavement periodically inspected to identify any defects or failures. This allows you to save money by making the necessary repairs at first detection. Our proven asphalt sealcoat application, coupled with a complete asphalt repair program, ensures customer satisfaction and the best economic value. Duval Asphalt is committed to giving your pavement investment the best protection possible. What you don’t know could be costing you money! Asphalt driveways, parking lots and roadways present a considerable investment by anyone’s standards. Due consideration should be given to how to protect such an investment. Much like our skin, or paint on a house, asphalt ages when exposed to environmental elements, such as sun and rain. To protect our skin, we apply sun block. Our houses receive a fresh coat of paint every 5 years or so to restore their beauty. Why should our asphalt be any different? In order to extend the life of asphalt, it needs to be sealcoated. Asphalt sealcoat is emulsified liquid asphalt combined with clays, sand and polymers engineered to beautify, preserve, and protect asphalt from oxidation, weather, water, petroleum spills and other environmental factors. If started early and continued on a routine basis, asphalt sealcoat can double the service life and seal cracks and other imperfections in the asphalt surface. Sealcoating is one of the most crucial portions of any pavement maintenance management plan. However, like all plans, if administered by a sub-standard contractor the plan will fail and could lead to a sub-standard asphalt performance. Sealcoating prevents the damaging effects of oxidation and water penetration. The sun’s ultra-violet rays harden and dry out the asphalt pavement surface. This accelerates raveling and erosion and can reduce asphalt thickness in just a few years. Sealcoating helps prevent this. Sealcoating restores original black color to asphalt and greatly enhances the overall appearance of your property. Asphalt sealcoating resists the highly damaging effects of gas and oil seepage and other road chemicals. There are many methods to repairing asphalt. Which method to use depends on the conditions the pavement exhibits. No one method can be applied to every situation. So it is important to have a trained professional from a trustworthy asphalt business evaluate the problem areas and prescribe the proper method of repair. Don’t get burned by a fly-by-night operation offering a cheap, quick fix that more times than not actually creates a bigger problem. Let Duval Asphalt’s trained experts evaluate your pavement, teach you potential causes, and present a long-term solution, backed by a well-established and reputable institution. Asphalt is a flexible pavement and has a specific life cycle based on its original design and intended use. As the pavement ages, it will require isolated asphalt repairs to maximize the life of the remaining system. Many elements can deteriorate asphalt. The cause of the failure and the service that the pavement is intended to provide will determine the type of asphalt repair needed. 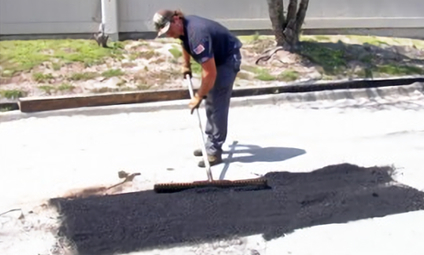 What you don’t know about asphalt repair could be costing you money. Sometimes the solution to your problem is as simple as filling a pothole or two. With our do it yourself EZ STREET® Pot Hole Repair cutting out the middleman has never been easier. Available in bulk or bags, let EZ STREET® make your life easier.